Representative John Shimkus from Illinois, the leader of the House Page Board, had interviews with the St. Louis Post Dispatch and with Allman and Smash in the morning at 97.1 FM in St. Louis this week. Rep. Shimkus represents Collinsville, IL and other communities across the river from St. Louis, Missouri. Shimkus: No, you know what really jeopardizes kids is those who had salacious instant messages in 2003 and did not release them. Allman: Apparently, if this guy Fordham came forward and said that Hastert was lying, he obviously had this information for the past three years and didn’t go on to ABC’s 20/20 or anything. I mean all along the line it seems these people knew and frankly Congressman Shimkus, if Shimkus says to me he didn’t know. I believe him. 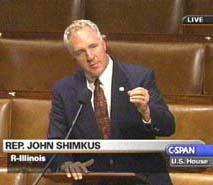 Of anyone you’re going to believe it’s going to be Congressman Shimkus. Shimkus: Even if people don’t believe me, what they will appreciate is the fact that this is now going to be a US attorney-FBI investigation. Everything I say to you and everything that I say to any reporter can be held against me in a court of law. So take my word because I am an honorable guy but understand that when I talk to you guys, that I can go to jail if I am not telling the truth. We would like to express our support for our congressman, Rodney Alexander, whose office sponsored our son’s position as a House page. As far as we know, Congressman Alexander’s conduct in this matter has been beyond reproach. He has tried his best to do what we have asked him to do from the very beginning: Namely, to protect the privacy of our son and family from the intense media scrutiny we are now having to endure. In the fall of 2005, as soon as Congressman Alexander became aware of the e-mails received by our son, he called us. He explained that his office had been made aware of these e-mails by our son and that while he thought the e-mails were overly friendly, he did not think, nor did we think, that they were offensive enough to warrant an investigation. Rather, we asked him to see that Congressman Foley stop e-mailing or contacting our son and to otherwise drop the matter in order to avoid a media frenzy. He did so. If we had any other knowledge or evidence of potential impropriety, we would have asked for the matter to be treated differently. For instance, we were not aware of the instant messages that have come to light in the past few days. Shimkus came out swinging in his interview with the St. Louis Post Dispatch again denying that his office was told about Foley’s behavior years ago by Kirk Fordham who resigned yesterday. The real question, Shimkus said in his interview with the Post-Dispatch, is who had the sexually explicit instant messages Foley had sent to underage boys and why didn’t they come forward earlier. Shimkus expressed frustration that he is “someone who actually confronted this guy” and yet he is under fire for his actions. And he accused the media of being “self-righteous,” noting that some newspapers had the same e-mails he had but chose not to publish stories until ABC News obtained the sexually explicit messages. “If you’re going to indict all of Congress because of this, then the media gets indicted because of their lack of moving forward on this,” Shimkus said.